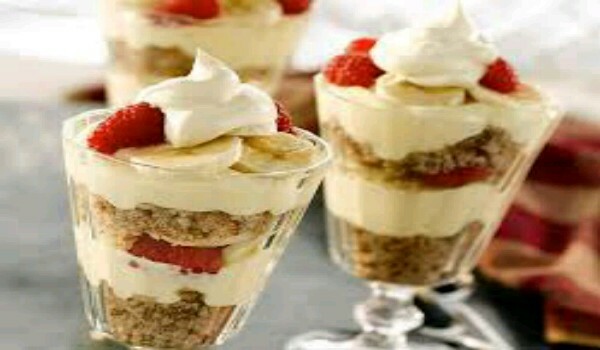 Parfait is an effortless dessert that can be put together at a short notice. Loaded with fruits and nuts, this creamy sweet dish has won so many hearts and tummies. Arrange a layer of the custard apple in a tall glass and pour some thick custard. Arrange a layer of chopped pineapple pieces over it. Repeat the layers until the top of the parfait is reached. Put a spoonful of whipped cream on the top. Sprinkle with flaked almonds and add a slice of kiwifruit.